Parents often confuse lactose intolerance with milk allergy, and although the two have similar symptoms, they are very different conditions. In order to pinpoint if your child is lactose intolerant, it’s important to be aware of the signs and symptoms of this digestive problem. Children who are lactose-intolerant don’t produce enough lactase – a natural enzyme that digests, or breaks down, lactose. Parents often confuse lactose intolerance with milk allergy, and although the two have similar symptoms, they are very different conditions. 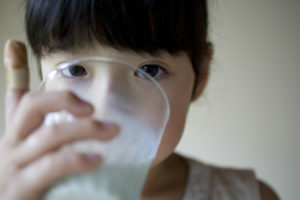 Lactose is a sugar found in foods that many children love — milk and dairy products, such as ice cream and soft cheeses. The list of other foods containing lactose is long and includes baked goods and some breads, ice cream, some candies, salad dressings, certain breakfast cereals, pancake mixes and more. Lactose also is in breast milk and instant formulas. Lactose is a disaccharide, meaning it’s a sugar made of two simple sugar molecules – glucose and galactose. For this sugar to be absorbed, the sugar has to be split into its components by an enzyme called lactase. This enzyme is found in the lining of the small intestine. For those who are lactose intolerant, the activity of the enzyme lactase is ineffective — which means it’s unable to digest and absorb the sugar found in milk and dairy products. Because this sugar cannot be digested properly, it gets fermented by the normal gut bacterial flora in the large intestine. The fermentation process then leads to symptoms — or warning signs — that can indicate your child is lactose intolerant. The improper digestion leads to fermentation of the sugar in the large intestine by the gut flora. This produces carbon dioxide and hydrogen, as well as certain products that have a laxative effect. Symptoms of lactose intolerance correlate with the amount of lactose that’s consumed. The more lactose your child consumes, the more symptoms he or she will experience. Symptoms can start in late childhood into adolescence and can become more noticeable into adulthood. Other than the symptoms and discomfort associated with this diagnosis, lactose intolerance is a non-threatening disorder with no long-term complications — just an altered diet lifestyle. Acquired lactose intolerance — This decline in the lactase activity in the small intestine lining occurs as part of normal aging. About half of the U.S. adult population could be lactose intolerant with varying degree of severity. Beyond childhood, the amount of lactose in the diet of an average U.S. adult is less than 10 percent of total carbohydrate intake. However, patients with symptomatic lactose intolerance may not be able to tolerate even the smallest amount of lactose. It is very unusual to see this before age 5. Primary lactase deficiency — This is an unusually rare diagnosis, and these babies have complete absence of the lactase enzyme from birth. Babies with primary lactase deficiency develop severe diarrhea while on breast milk, forcing them to require special formulas. This is a recessive trait, and the baby has to acquire one abnormal gene from each parent to have the symptoms. Secondary lactose intolerance — This is a temporary intolerance and seen after irritation of the digestive system – sometimes known as “acute gastroenteritis.” This occurs due to temporary damage to the intestinal lining following infection. Patients often have preceding nausea, vomiting and diarrhea but continue to have diarrhea when consuming lactose-containing foods. Rotavirus and giardiasis are two infections associated with temporary lactose intolerance. With rotavirus vaccination, this is becoming less of a problem; however, other viral and bacterial gastroenteritis can be associated with lactose intolerance. Celiac disease, a digestive disorder that causes damage to the small intestine when gluten is ingested, can be associated with temporary lactose intolerance. Those with celiac disease can tolerate lactose-containing foods once the intestinal lining heals after going on a strict gluten-free diet. Crohn’s disease, an inflammatory disorder of the bowel, also can be associated with lactose intolerance, and this often improves once adequate treatment is instituted. It’s quite easy to test for lactose intolerance, and it’s done using the lactose breath test, which tests for hydrogen levels in the breath after consuming lactose. Normally, little hydrogen is detected in breath, but raised hydrogen breath levels indicate the improper digestion of lactose — which could indicate lactose intolerance. In young children and those who cannot perform the breath test, strict elimination of lactose-containing food for two to four weeks is another option. Although there is no cure for this digestive problem, dietary modifications can make a huge difference for your child. I also recommend children with lactose intolerance take an over-the-counter lactase enzyme supplement when lactose-containing food is consumed to help alleviate symptoms. Over time, you and your child will learn how much dairy-based food and drink he or she can handle. For patients with significant symptoms, the help of a dietitian is helpful to identify foods containing lactose. It is also important to ensure that adequate intake of calcium and vitamin D is maintained, since dairy is normally a good source for these nutrients.